The 3168 Cross is constructed of lines drawn 3168 furlongs north, south, east and west from where latitude 3.168° south crosses longitude 31.68° east. 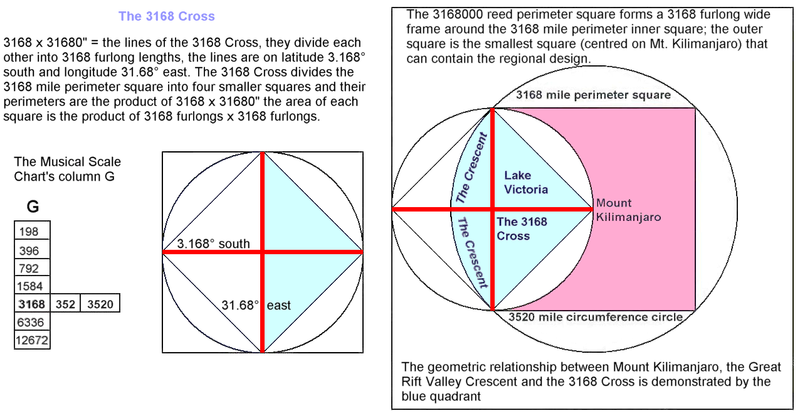 The 3168 Cross is the governor and interpreter of the regions geographic features meaning the geographic features that conform to a geometric plan, the 3168 Cross supplies us with exact measurements needed to interpret the geometric geography. The 1/10th scale model great circle of the earth fits tangent around the 3168 Cross, the circle perfectly contains the Great Rift / Mount Kilimanjaro Quadrant which covers exactly half of the circle’s area. 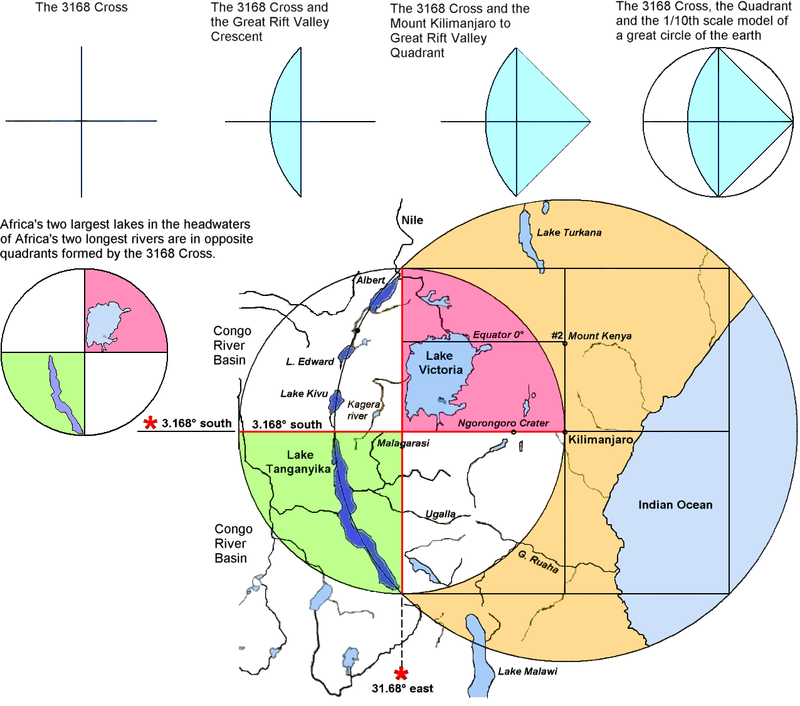 The Great Rift Valley Crescent starts and ends on longitude 31.68° east and on the northern and southern extremities of the 3168 Cross, the Crescent has only one line of symmetry which is on latitude 3.168° south. The pivot point of the Mount Kilimanjaro / Great Rift Quadrant is on latitude 3.168° south and the eastern extremity of the 3168 Cross which is high up and above the tree line on Mount Kilimanjaro. Below: We placed a 3168 mile perimeter square tangent inside a circle and centred them on Mount Kilimanjaro producing four crescents, the western crescent is the Great Rift Valley Crescent in situ, it is aligned to longitude 31.68° east and latitude 3.168° south is its only line of symmetry. The portion of the music chart below shows these numbers in a row, 3168, 352, 3520 which means that 3168 Hertz = G three above and adding 352 Hertz = 3520 Hertz which is the note A three above, so 3168 + 352 = 3520. The 3168 mile perimeter of the square around Mount Kilimanjaro plus 352 miles = the 3520 mile circumference of the circle around Mount Kilimanjaro, (the circle’s diameter is slightly over 1120 miles and 1120 miles diameter x 22/7 = 3520 miles circumference). The numbers 3168 and 352 on the Musical Scale Chart refer to the name and birthplace coordinates of the Lord Jesus Christ, the gematria of “His Name” in the Hebrew text of the Bible = 352 and the gematria of “Lord Jesus Christ” = 3168 in the Bible’s Greek text, latitude 31.68° north crosses longitude 35.2° east in Bethlehem where Jesus was born and the Crucifixion was 31680 feet (6 miles) away outside the old city of Jerusalem. The reason these things are mentioned here is because the 3168 Cross and the region’s geographic design are surrounded by and interact with a huge latitude longitude design which is subtended from the Bethlehem’s latitude and is produced using measurements of 31.68° and 35.2° of latitude and longitude. This design reaches from latitude 31.68° north to latitude 35.2° south and if the Lord Jesus Christ had not been born in Bethlehem where latitude 31.68° crosses longitude 35.2° east the amazing design would have no relevance, the large latitude longitude design is shown on the next page. We will describe the basic measurements of the 3168 Cross using only the numbers of the musical scale chart’s column G we will also use all the numbers. Both lines of the 3168 Cross = 1584 miles or 12672 furlongs, each line = 792 miles or 6336 furlongs, the lines divide each other into lengths of 396 miles or 3168 furlongs = 198000 reeds. Sorry about the extra zeros on the last number but we have just used all the numbers of the musical scale chart’s column Gher . The occurrence of the column G numbers throughout this investigation is so common that it usually is not commented on but the above is one of the more important examples because if we add a zero to every measurement above it would apply to the earth and the cross on the earth would be formed by marking the earth’s axis and equator. The standard way to calculate the area of a circle is pi x radius squared, so to calculate the area inside a great circle of the earth is 864/275 x 31680 furlongs x 31680 furlongs = 1003622400 square furlongs, in other words the area of a 31680 furlong x 31680 furlong square x pi equals the area of a great circle of the earth. It is interesting that the above square’s perimeter is 1003622400 inches the product of 31680 x 31680 inches = 15840 miles perimeter. It is also interesting that 31680 x 31680 inches = 15840 miles which is the diameter of a circle that has an area equal to the surface area of the 31680 furlong radius earth. The 31680 x 31680 inches = 15840 miles and equals both lines of the cross marked on the earth, this is all the more interesting when we keep in mind that a square placed tangent around the 31680 furlong radius earth has a 31680 mile perimeter and if we take the earth’s circumference away from the square’s perimeter the remainder equals the moon’s circumference. In other words the circumferences of the earth and moon = 31680 miles exactly, (via the 22/7 method for pi). From Bethlehem to Jerusalem is 6 miles or 31680 feet, the 31680 feet represents the life of the Lord Jesus Christ because it takes us from his birthplace on 31.68° north to Jerusalem and the Crucifixion.